Photographed above is Ms. Jaci Barnett and Mr. Robert Bosch. Three patents, two of which were filed during doctoral studies at the NMMU, form the basis of a new technology that is changing the way that rubber gets made. 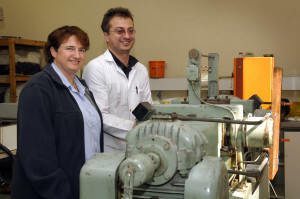 Currently being commercialized through Rubber Nano Products (Pty) Ltd, a spin off company of the NMMU, the inventions allow the replacement of zinc oxide in rubber. Current sales are increasing as manufacturers change to the RNP product, ZR6, which is manufactured at a toll production facility in the Eastern Cape.